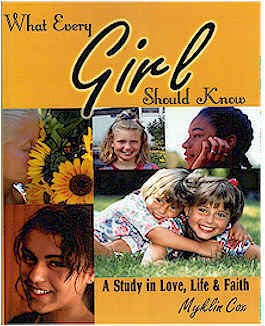 In What Every Girl Should Know: A Study In Love, Life, & Faith, one topic Myklin addresses is how a Christian girl should relate to the guys in her life. Everywhere we turn today, society is telling girls that God doesn't need to have anything to do with their relationships with guys. This culture tells us that having emotional and physical purity is unnecesary (not to mention out-of-date) and that Biblical modesty is irrelevant. Many girls are made to believe that there is something wrong with them if they don't have a boyfriend/relationship. These mindsets can be damaging and can result in painful physical and emotional baggage for young women! God does indeed care about how girls approach relationships with their brothers in Christ. He also has laid out guidelines and principles from His Holy Word to help young ladies discover what He would have them to do regarding this issue! How to stay focused on the Lord instead of guys! Inspiring love stories of individuals who waited patiently for GOD'S BEST!